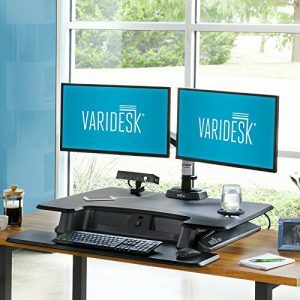 Varidesk continues to be one of the biggest names in height adjustable stand up desks and sit and stand desk converters. It has multiple lines of full desks, standing desk converters and accessories for each. However, I have one in mind today. 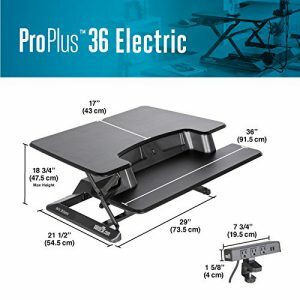 I’d like to run through the Varidesk Adjustable Height Stand-up Desk Pro Plus 36 Electric. It’s one of the only electric desk converters I’ve seen out there, and people seem to be very happy with it. So, let’s take a look. The Varidesk adjustable height stand-up desk Pro Plus 36 Electric comes fully assembled. All you need to do is take it out of the box, put it on your desk, plug it in and you’re ready to go. It’s as easy as that. One of the biggest complaints with most standing desk converters and the first thing I look at is the size of the keyboard tray. It’s usually quite small and a full keyboard and mouse fit a bit too snuggly. If you’re doing graphic design or editing videos, you need space and room to be able to move your mouse. (Unless you have a trackball mouse or this mouse, which I highly recommend). However, the Varidesk adjustable height stand up desk Pro Plus 36 Electric has plenty of room for a full keyboard and more than enough left over for a standard mouse. My favorite feature of this Varidesk Adjustable Height Stand-up Desk Pro Plus 36 Electric is the electric control of this desk. I’ve seen very few electronic standing desk converters on the market. Most use pressured gas or hinges for the up and down mechanism. 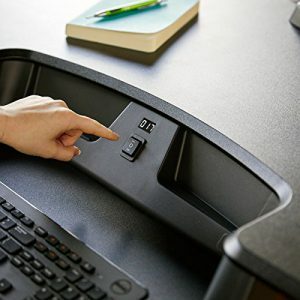 This stand-up desk converter does with the push of a button. No physical moving involved. With the small LED screen, you can see exactly where you want your height set at. If you’re not sure of the perfect height for you, check out my article: How to Use a Standing Desk. It will explain how to see if this option works for you. The first time you set this up the Varidesk pro plus 36 electric, all you have to do is remember your standing height number and after that, you can easily move from sitting to standing by watching the number. The numbers range from 1-lowest to 100-highest. So, naturally, the taller you are, the higher your number will be. It can increase its height by 18.75″ which should accommodate the majority of people. As I’ve mentioned in previous articles, being taller than 6’3″ can cause some issues. I’m right at the cusp (never quite reached 6’3″ [sore subject] and the height works well for me). The top, which measures 36″ x 17″ has plenty of room for two monitors. I would recommend the dual monitor arm set up, for those of you who use two monitors. 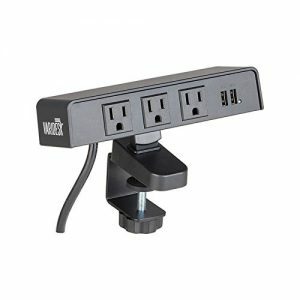 It seamlessly clips onto the back of the sit-stand desk converter for ease of use. There’s also a cable management system to make sure when you raise it and lower it, chords aren’t getting tangled and pulling this off your desk. This is a nice, standard standing desk mat. 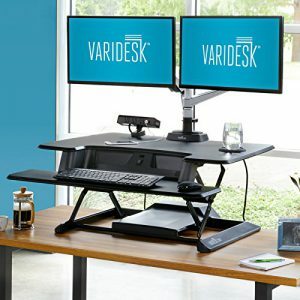 It’s going for $60 on Varidesks website, but I probably wouldn’t recommend it. If you use this desk correctly, sitting/standing every 30 minutes, then you’ll have to bend over and move this out of the way 16 times a day. Your chair probably won’t make it over the lip, and if it does, you won’t have much mobility. 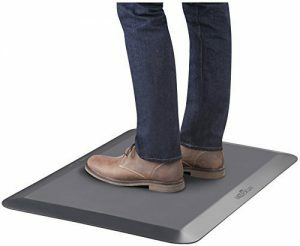 I would recommend the Sit-Stand Smart Mat. You can see why by checking out my article, but its ease of movement is the main reason. This accessory, as I mentioned, I would definitely recommend. 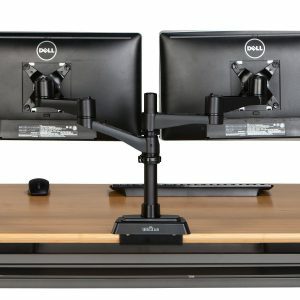 It comes with a clip that fits perfect on this sit stand desk converter, so you have your dual monitor set-up without any problems. The PowerHub, which comes with 2 USB and 3 AC outlets, is pretty nice and will help you to keep your most essential electronics on hand. However, if you buy the Varidesk Pro Plus 36 Electric then it already comes with one. A freebie worth about $45. * Caution! It weighs almost 50 lbs so if you’re a bit smaller make sure to get a helping hand. It obviously has to be that heavy, so when it raises up, and you move the monitors the whole thing doesn’t go with it, and you have to pick your computer up off the ground. Be careful when taking it out of the box and putting it on your desk. Another thing that you’ll run into with all adjust height stand up desks, not just the Varidesk pro plus 36 electric, is if you use a laptop (which I do) then the screen may be a bit to low for you. As we know the top of your monitor should be level with your eyes so you’re looking ever so slightly down. However, with any height adjustable stand-up desk that isn’t the case. As you can see in the photo below, the laptop screen is a few inches lower than my second monitor. For me, it’s not a deal breaker but it’s something to consider. I call this Varidesk Adjustable Height Stand up Desk Pro Plus 36 Electric a hybrid because 95% of the electric height adjustable standing desks on the market are full desks. However, this is a nice middle ground between sit-stand desk converters and the full sit-stand desk options. If you don’t have the room for a full desk, and you’d rather have something electric, this is the perfect niche piece for you. The electrical up and down means you’re much more likely to use it than a hand or even handle mechanisms. Having to physically move something 16 times a day becomes a huge hassle, and so, in the end, you just stop doing it. That’s why I love this Varidesk adjustable height stand up desk workstation so much. If you’re interested in my top picks for Ergonomic products I’ve created a list of the Top 5 Ergonomic Office Products to Prevent Pain and Increase Productivity. Unfortunately, this didn’t make the cut for the best option so go take a look! Happy Freelancing everyone and stay healthy! Are you looking to buy a Varidesk adjustable height stand up desk? What are your favorite options? Does the Varidesk Pro Plus 36 Electric make your list? Last year I switched to a stand-up desk and have never looked back. I feel so much better now that I’m not sitting all day, every day. In addition, my posture has improved as well. This one looks like a nice one and just yesterday my friend asked me what one I had. Since I’m not that happy with the one I went with, I’m happy to know about this one and will share your post with her. Thanks for your through review! I love to hear people say that they’ve switched to stand up desk and haven’t looked back. If you follow the right method and routine it can be one of the best things, not only for your body, but also your company. Which one did you end up buying and why aren’t you satisfied with it? If your friend is looking for a full-sized electric stand up desk then she should take a look at this article I wrote a while back: The Perfect Height Adjustable Standing Desk – Any budget, any sized office The last option, th eApex Desk, has incredible reviews and everyone I’ve talked to seems to be very happy with it. She can also look here: Height Adjustable Standing Desk – What to look for when you buy which will give her things to look for when she’s out shopping around. I hope that’s helped and have a nice day! Happy Freelancing! I am a huge advocate for stand up desks. I have one of the electric lift ones at work, not this one though. For anyone with back pain or shoulder pain give it a go. The other people at my work are reluctant to go out and get their own but as soon as I am away for the day they fight over it. Thanks for leaving a comment! I completely agree. I think everyone who works with a computer should have a stand up desk. If you’re forced to stare at a screen for 8 hours because of your job, your should at least be able to stand and do it. The negative effects of sitting are well known and every HR department should be aware of them. If you’re ever looking for a stand up desk for your home let me know and I’ll definitely point you in the right direction. Thanks again and Happy Freelancing! I’ve definitely been looking into a standing desk for the last month as I entered into the field of affiliate marketing and I’ve been sitting more than ever. My massage therapist noticed how much stiffer I had become because of that. And that was only from a month! I think this desk is worth the investment even though it’s on the pricier side. I mean, look at that power hub… damymn! I’m going to shop around a bit longer, but I’ll keep your review in mind when I make the decision. Thanks for stopping by. This is a perfect standing desk converter for many people but I’ve always truly been an advocate of full heigh-adjustable standing desks. At least for what I do. You can check out: The Perfect Height Adjustable Standing Desk – Any budget, any sized office. The last one, the ApexDesk has gotten really impressive reviews. Also, if you need a bit of guidance as to what you should look for when you’re going to buy one I wrote an article: Height Adjustable Standing Desk – What to look for when you buy that should point you in the right direction. If you ever have any questions please don’t hesitate to ask. Have a good one and Happy Freelancing!